September 2010 deployed to Afghanistan on Operation Herrick 13. Died, age 22-months, on 1 March 2011, in the line of duty and within hours of his handler. 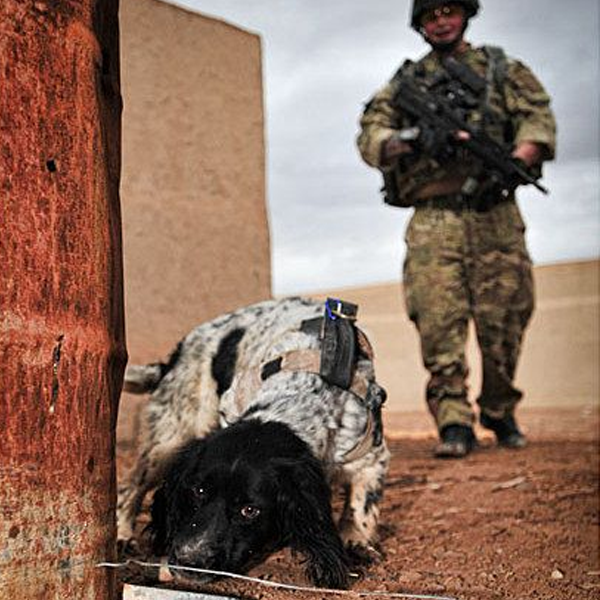 Theo, a black-and-white speckled Springer Spaniel was gifted to the Royal Army Veterinary Corps by a member of the public. What was Civvy Street’s loss, became the RAVC’s gain. 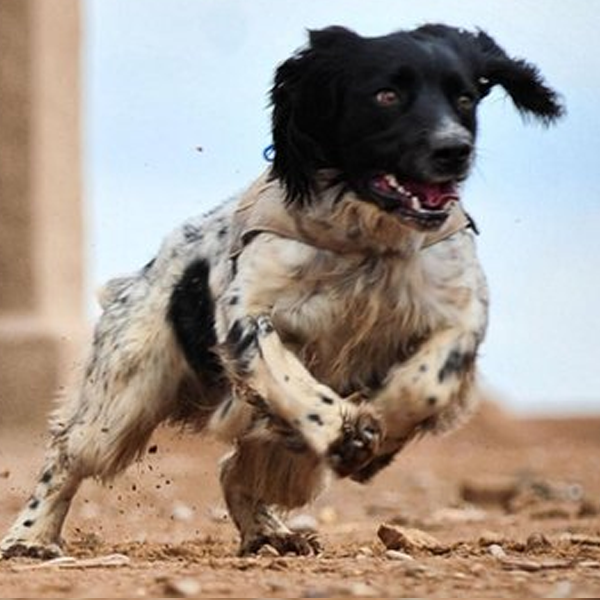 Slender, speedy, agile, intelligent and cheeky were just some of the words his soldier friends used to describe this incredibly successful Arms and Explosives Search dog. While under-going his training at the Defence Animal Centre in Melton Mowbray, it was clear to everyone that Theo had something special about him. At 17-months old the Springer was making a name for himself and, with Operation Herrick 13 looming, his cards were marked for a tour of Afghanistan. Matching Theo with the right handler was to secure the success of the partnership in the field. Theo had the necessary high drive required for an Arms and Explosives Search dog and he worked with precision and flair. His handler would need to be someone with an equally driven approach. Lance Corporal Liam Tasker had seen Theo going through his paces and been impressed by the dog’s bouncy character and outstanding skills. During his pre-deployment training, L/Cpl Tasker decided that he wanted to be Theo’s handler in Afghanistan. Two weeks after deployment in September 2010, Liam and Theo were matched and, as predicted, they bonded immediately. Respect and high drive from the dog combined with dedication and intelligence from the handler produced immediate results on the ground. Phone calls home included news of Theo’s exploits and Liam’s family included treats and gifts for Theo in their parcels sent to Afghanistan. It was clear to everyone that Theo was not just Liam’s “best bud”, he was part of his loving family. Liam sewed the iconic Para Wings onto Theo’s harness which also bore his RAVC tactical recognition flash (horizontal stripes of dark blue, yellow and maroon). Both were worn with pride and Theo’s natural military bearing. 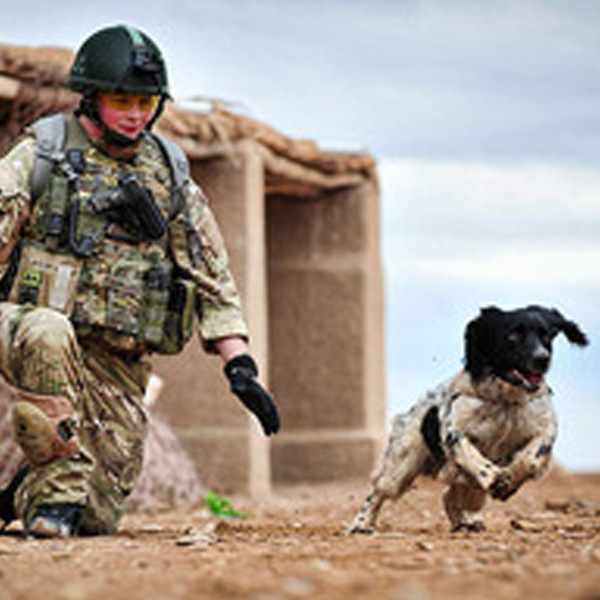 On 14 February 2011 the media featured Theo and Liam who had been selected to showcase the work of all the Military Working Dog teams deployed to the conflict in Afghanistan. News reports and press headlines including:” Theo, the Superhero spaniel!” left the readership in no doubt that Theo was an exceptional search dog and his partnership with Liam a life-saving force. At that point, five months into their tour of duty, Theo had located a record 14 Taliban roadside bombs and weapon caches and, consequently, saved many lives. Tuesday, I March 2011 – while on patrol with No 2 Company, 1st Battalion Irish Guards Lance Corporal Liam Tasker, of the Royal Army Veterinary Corps 1st Military Working Dog Unit was killed in action in the Shingazi area of Nahr-el-Sarraj in Helmand Province. Theo, the soldier’s Arms and Explosives Search dog, who was alongside his handler when he fell to a sniper’s bullet, died hours later from a seizure. Some believe Theo died of a broken heart. Theo was half of a rare partnership of dog and handler that expressed professional excellence and a degree of loyalty that went beyond the requirements of duty. Lance Corporal Liam Tasker was the 358th member of British military personnel to die since the conflict in Afghanistan began in 2001. 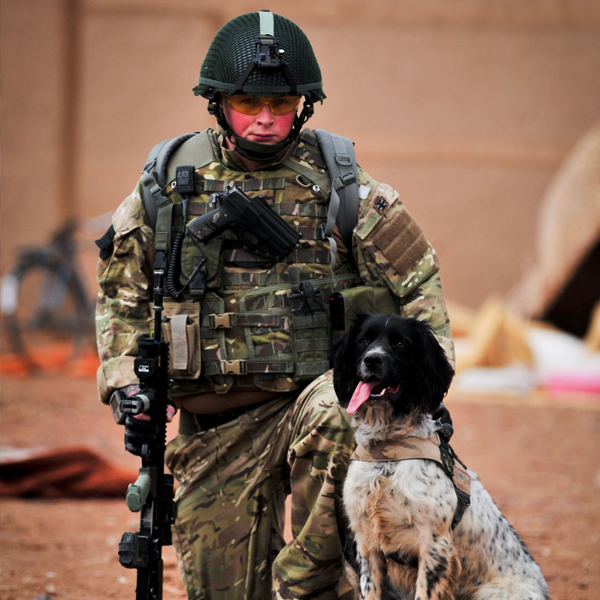 Liam and Theo were the second RAVC dog and handler partnership to lose their lives in the conflict following the deaths of Lance Corporal Kenneth Rowe and his Arms and Explosives Search dog Sasha were killed in action on 26 July 2008. Liam, who was Mentioned in Despatches, left behind a ‘pen picture’ of Theo which chronicled his love and respect for his young dog who had saved so many lives in a field of conflict. The handwritten profile contributed to Theo being awarded a posthumous PDSA Dickin Medal – the animals’ Victoria Cross – on 25 October 2012.